The progression of the 2015 total solar eclipse, imaged from Svalbard, Norway, by astrophotographer Kevin Morefield. When Kevin Morefield was young, he wanted to be a sports or nature photographer. "I wanted to work for Sports Illustrated or National Geographic," he told Space.com. "But only like, 20 people in the world have those jobs, so I got into finance instead." Morefield said learning to get good shots of an eclipse involves a certain amount of trial and error. During one eclipse, he taped solar filters to his camera lens for the partial eclipse and then pulled them off at the start of totality (when the moon fully covers the disk of the sun). "I thought I had it on video and I ran back the tape — in 2010, HD digital video still shot on tape — and I saw I had it," he said. "Then the mayor wants to come up and talk and I took video of that and I [later] found I'd taped over it." One tip Morefield offers for people photographing eclipses: Make sure the camera is in focus during the partial phases. Shoot through a solar filter — otherwise the sunlight will just wash out the picture (and potentially damage your equipment and eyes) — and focus on the edges of the sun. He added that making sure the exposure time is set appropriately is also key, because catching the relatively dim corona (the sun's outer atmosphere) during totality will require different settings than a filtered shot of the partial phase. Lastly, a tracking mount — one that follows the sun across the sky — is essential for close-in shots of the sun. A two panel mosaic of the Orion Nebula (M42) on the right and the Running Man Nebula (sh2-279) on the left, taken by astrophotographer Kevin Morefield. The image required a total of 18 hours of exposures. When watching an eclipse — especially a total solar eclipse — most experts recommend focusing on what's happening in the sky rather than fiddling with a camera. On his earlier eclipse shoots, Morefield used a remote shutter release and a tracking mount for that reason. "You might try to get what's going on with people and the sky and the ground," Morefield said. "Like, the diffraction pattern you see on the ground that lasts 3 or 4 seconds. With a superwide angle, you're more likely to see the shadow bands. Or, one could look for projected images of the eclipse made by ordinary objects. A straw hat or leafy tree, for instance, produces dozens of tiny, projected images that can create interesting shots." When photographing cosmic events, should sometimes it's good to focus on the ground as well as the sky, said astrophotographer Kevin Morefield. Shown here, a shot by Morefield of the northern lights over Svalbard, Norway, in 2015, and a crowd of skywatchers viewing the light show. Morefield outlined how he will be taking his pictures during the Aug. 21 total solar eclipse. His program, he said, starts about a minute before first contact (when the moon begins to overlap the sun). About half of the pictures will be taken during totality, which will last for just over 2.5 minutes in his viewing location. The exposure times will range from 1/1600 of a second to 2 seconds. Before he takes off the solar filter, he will check the camera's focus. Before totality, Morefield says he typically uses a 1/1600 speed and f/8 aperture setting. 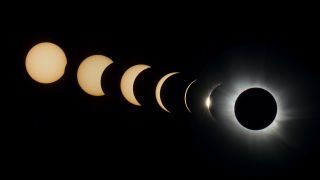 He pulls off his solar filter when the "Baily's beads" and "diamond ring" effects appear: these are the last spots of light visible on the edge of the moon before the sun's disk is fully hidden. During the diamond ring phase, Morefield said the corona begins to become visible. He said he uses "bracketed exposure" while imaging the diamond ring, which means taking several pictures at different shutter speeds. "I'll use a combination of three or so exposures in the diamond ring phase, with exposures also at 1/25 to 1/800," he said. For "Baily's beads, he uses1/4000 to 1/8000" exposure times. His first exposures of totality will be short, and they will get longer with each shot. A "diamond ring," which occurs seconds before or after totality during a total solar eclipse, captured by Kevin Morefield. Morefield's adventures with eclipse photography started in 2002, but his interest was piqued before that. He grew up looking at the sky through his home telescope and saw a partial solar eclipse over his home in the 1970s. Amazed by pictures of total solar eclipses, seeing one in person became like a "holy grail." He finally planned a trip with his father to see the total solar eclipse over Australia in 2002. "We had to fly 24 hours to get to Adelaide to drive on the wrong side of the road," Morefield said of the trip. "When we got there, it was with a group of like 1,500 other people … from all over the world." Seeing a total solar eclipse with such an international group was "a little bit like the Olympics, where people put aside all their differences," Morefield said. "Totality was 27 seconds long and the minute it was over, everybody's like, 'It was worth it.' It's really an emotional experience." Follow Jesse Emspak on Twitter @Mad_Science_Guy. Follow us @Spacedotcom. We're also on Facebook & Google+. Original story on Space.com.